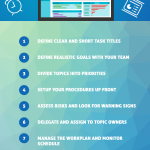 These top 10 tips for successful task management can help you build, manage, and execute your tasks clearly and more efficiently. Our short sections highlight, for example in terms of priority, process execution or risks, where it is important to focus on. Daily teamwork means that you are confronted with many tasks every day. Being productive also means being clear and express yourself clearly. It is important to keep in mind that you provide short and precise information. Whether it is the ABC method, the Eisenhower principle, the Pareto approach, tasks should be divided into priorities, otherwise the time spent on it will not be used efficiently. A structured distinction of the importance of tasks proves to be extremely helpful. No matter whether in handwriting, picture, sound, by signing, and in many other ways, a clear, precise and understandable task is the key to a successful task management. Processes and content between the sender and the recipient must be agreed beforehand and leave no scope for interpretation. A chain is always as strong as its weakest link, says a proverb. This also applies to the strength and cohesion of a team. A poorly organized team not only brakes the workflow, but in the worst case also causes damage in the long term. Before and during the handling, it is essential to maintain a steady communication between sender and recipient over feasibility, status, progress and implementation. However, it is the responsibility of the task manager to make the processing level transparent in order to avoid possible risks. Do you know the competences of your team members? Try to identify the strengths and weaknesses of each one of your team, and then delegate appropriate tasks to the ones who can best perform the tasks that meet the requirements. Create a work plan with a ranking of your goals and values as a prerequisite, a division of tasks according to urgency and importance, and the distribution of tasks within your team. Check the processing level at short intervals and ensure that as few subjects as possible need to be presented to the task manager a second time. Personal contact is important, but try to establish a reasonable balance of meeting sessions. Make sure that each session is well prepared, and you will end up with a brief maneuvering critique, which helps each participant to evaluate the situation holistically. Systematic task management is closely linked to consistent time management. Completion, start of the work and the progress should be recognized and communicated transparently. Several good practices can be found under the term self-management. The processing and development of tasks can harbor problems that are often not recognized early enough, so it is useful to monitor them sustainably. If problems arise, they must not be ignored or postponed – it must be counter-steered accordingly in order to meet expectations again. Please include attribution to https://blog.teamelio.com/en with this graphic.